[...] Local artists Ioana Singureanu, Alexandra Derderian and Mary Hart each painted six concrete security blocks, and Bret Weese painted 12 jersey barriers. [...] Singureanu, of Windham, N.H., said she felt the blocks needed a textile-like covering to create a softer feel. She made stencils and covered the blocks with repeating patterns reminiscent of Lowell's multicultural past and present: Grecian keys, Celtic knots, Scottish houndstooth, Southeast Asian-inspired patterns and a Romanian cross-stitch embroidery pattern from her own heritage. "That was the idea -- to remind us that we're all a quilt of different cultures, and we come together in these beautiful patterns," said Singureanu, who works at Lowell's Brush Art Gallery. 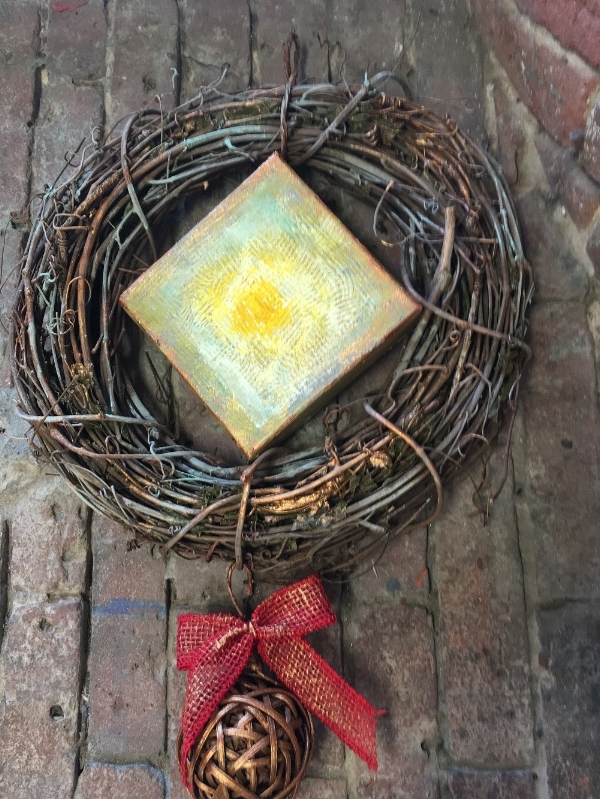 I created and sponsored a wreath for this event... trying to bring the natural and hand-made together into a timeless art wreath... it was great fun but managed to anchor my painting into the wreath. Using a wreath as a frame for my work was whole point. The Lowell Sun covered this event and featured this wreath.